They weren't mollified when nominee-in-waiting Barack Obama gave prime-time speaking slots to Clinton and her husband, the former president. Instead, they're itching for a fight and plan to wage one in Denver. One group intends to paper the city with fliers, promote a video detailing what they contend were irregularities in the nominating process and unleash bloggers to give their take on the proceedings. Another group has purchased newspaper advertisements demanding that Clinton be included in a roll-call vote for the nomination. "I am a very realistic woman," said Diane Mantouvalos, co-founder of the Just Say No Deal Coalition. "I don't think that anything is going to change, but I do think it is important to be heard, and this is our way of doing it." Some of the disaffected Clinton supporters are open to supporting Obama; many are not. 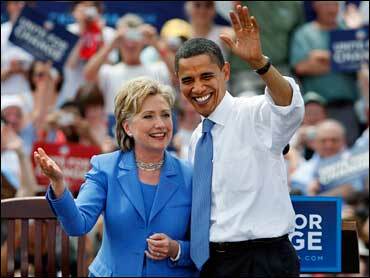 Obama needs Clinton's supporters to beat Republican John McCain. Polls show that he has won over most of them. But some simply don't like Obama or still feel Clinton was treated unfairly during the primaries. These groups are not affiliated with Clinton, who has endorsed Obama and campaigned for him. Representatives from the Clinton and Obama campaigns said they are working to unify the party because Obama will champion issues important to Clinton supporters, such as reforming health care, improving the economy and ending the war in Iraq. "Senator Clinton understands and appreciates that there are supporters who remain passionate, but she has repeatedly urged her supporters to vote for Senator Obama," Clinton spokeswoman Kathleen Strand said. House Speaker Nancy Pelosi took a swipe at the Clinton die-hards Wednesday. "I think Hillary Clinton has been very gracious," the San Francisco Democrat told Bay Area talk show host Ronn Owens. "I think some of her supporters have been less than gracious." Nevertheless, many Clinton activists plan to voice their discontent in Denver. Mantouvalos, a Miami public relations consultant, said her network is renting a 5,000-square-foot loft in Denver for its bloggers. Another outfit called The Denver Group is planning a reception the evening Hillary Clinton speaks at the convention. The group, which is pushing for Clinton's name to be placed in nomination, also hopes to raise enough money for a TV ad. The Clinton and Obama campaigns have pledged in a joint statement to "ensure that the voices of everyone who participated in this historic process are respected" at the convention. "The only way a Democratic Party will have the credibility to elect a Democrat in November is if the party uses a legitimate process to choose its nominee," said Heidi Li Feldman, co-founder of The Denver Group. "We are not per se a Clinton support group, we are a Democratic Party get-your-act-together support group." Some of the activists complain the Obama campaign manipulated party caucuses; others feel the media treated Clinton unfairly. Nearly all are still angry over how the party divvied up delegates from the Florida and Michigan primaries. With the agreement of all Democratic candidates, the states were initially stripped of all their delegates for violating party rules by holding early primaries. None of the candidates campaigned in the two states, but Clinton won the two primaries and thereafter tried to get all the delegates seated. The national party reinstated the delegates in May, but gave each a half vote. And it awarded Obama some Michigan delegates, although he had taken his name off that ballot because of the party's initial decision. With the nomination clinched, Obama said this month that he would seek to give both delegations full voting rights. At the very least, the activists want Clinton's name put in nomination, with a full roll-call vote. Some won't be satisfied unless Clinton is declared the nominee - an unlikely prospect. Others would be happy if Clinton were asked to run for vice president - also unlikely. Feldman, a Georgetown University law professor, said she is a loyal Democrat who won't vote for McCain, but Obama hasn't won her support. Will Bower, co-founder of the Just Say No Deal Coalition, said he would only support the Democratic candidate if her name is Clinton. "I have been voting Democratic for 18 years. I only voted for Democrats, from dog catcher to president and everything in between," said Bower, who lives in Washington. "I will be voting for someone other than Barack Obama come November."